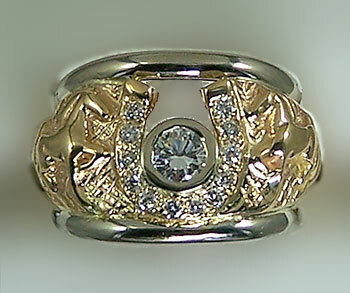 "Diamond Horseshoe Ring with Horses"
Diamond Horseshoe ring great for the western side of you! Get all fired up with this fantastic cigar band! Custom crafted out of 14kt yellow and 14kt white gold offering a horseshoe set with all matching brilliant cut diamonds. To top it off we have set another diamond in the middle of the shoe.